Quinoa, the super-grain from Peru, here shows its affinity for other New World foods: potatoes and pumpkin seeds. The resulting hearty pilaf is exactly the kind of high-protein and high-fiber dish we want to put in the center of the plate. It feels almost like showing off to mention that it is also one of the tastiest things I’ve eaten in a while. Serve it warm with generous servings of hot roasted root vegetables and a spicy relish — there’s dinner. Or let it cool and toss it with spinach leaves and a citrus-spiked vinaigrette for a wonderful salad. Rinse the quinoa by rubbing it lightly with your fingers in a bowl of water, then drain it in a sieve and run fresh water through it for a few moments. Bring about 10 cups of water to a boil, add a teaspoon of salt and the rinsed quinoa, and let the grain boil gently for about 14 or 15 minutes, or until you see the little white rings breaking free and the grain is tender but still crunchy. 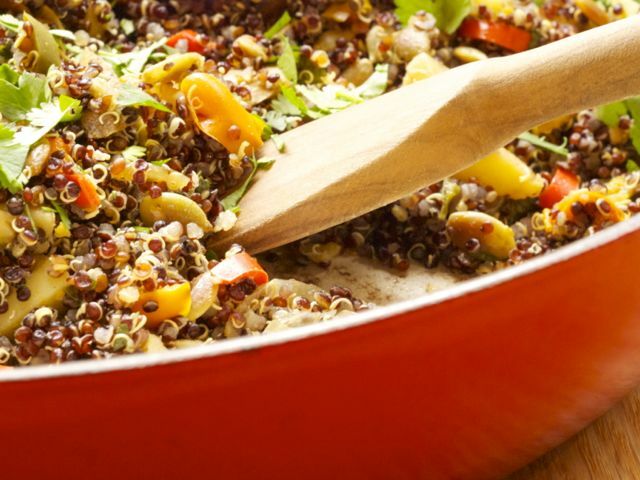 Drain the quinoa and set it aside; you should have about 4 cups cooked quinoa. Heat 2 tablespoons olive oil in a large nonstick skillet. Add the onion and potato, and half a teaspoon of sea salt. Toss frequently over high heat for about 2 minutes, then add the pumpkinseeds and sauté another 3 or 4 minutes. You will see some brown spots, and the onions will be wilted. Add the bell pepper and jalapeño, another pinch of salt, and 2 tablespoons water. Turn the heat down to medium-low, cover the pan, and cook for another 12 to 15 minutes, stirring and turning a couple of times. All the vegetables should be tender. Add a tablespoon of fresh lime juice and toss quickly as it cooks away. Add the cooked quinoa and the vegetable broth or water, give everything a stir, and cover the pan for another five minutes. The quinoa should be steaming hot and moist. Toss the hot pilaf with the chopped cilantro, and another tablespoon each of lime juice and olive oil. This quinoa pilaf can be made several hours ahead, up to the point of adding the cooked grain to the vegetables. Cook the quinoa, prepare all the vegetables, then put them together, heat five minutes, and toss with cilantro, lime juice, and olive oil just before serving. Any leftover pilaf can be tossed with small spinach leaves or with a combination of winter greens (such as arugula, mizuna, radicchio, or baby chard) for a delicious salad. Dress it with olive oil and lemon or lime juice.